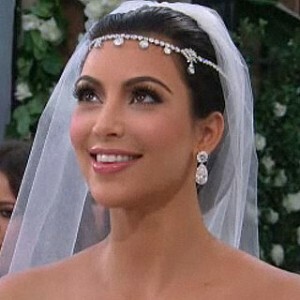 She may not be a princess, but it was definitely a fairytale wedding for Kim Kardashian as she wore not one, not two, but three custom-made Vera Wang dresses (very Nicole Richie and her 3 Marchesa gowns). The blushing bride stayed true to her signature makeup look with dark smokey eyes, long faux lashes, pink blush and pale pink lips with a hint of gloss. We love that Kim stayed true to her normal makeup look, accentuating her natural beauty rather than looking too overdone. Kim’s hair was sleek back into a fuss-free chignon. The highlight – Kim’s diamond wrap around headpiece, adding a modern touch to the classic tiara. This is one trend that will be coveted by many brides-to-be.